His Mercedes G-Wagon was burnt beyond repairs in Lagos recently. Read here if you missed the story. Speaking on a monthly Radio and Television Programme monitored by INDEPENDENT in Ado-Ekiti, Fayose, who said he would neither be swayed nor distracted by the incident, also thanked God for saving his life. 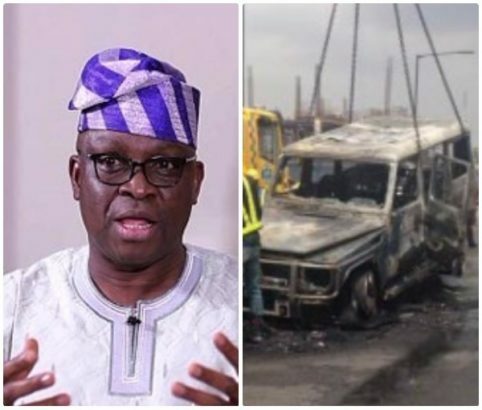 Former Minister of Aviation, Femi Fani-Kayode, had claimed that Ekiti State Governor, Ayodele Fayose, was the target of a “spiritual bomb”, after his official car was burnt to ashes in Lagos. In a tweet last Thursday, Fani-Kayode stated that Fayose escaped because of the God he serves.